Photograph of the 1944 Mental Hygiene Class. 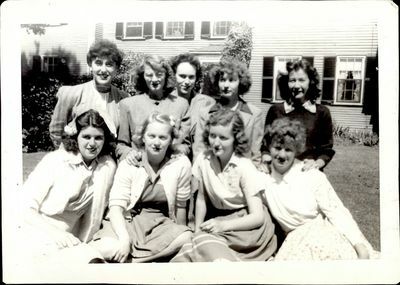 Top row from left to right: Gloria Kuperman, Marjorie Mekusker Flannery, Mildred Goss Jones, Dorothy Stackpole, Ruth Hogan Como. Bottom row from left to right: Betty Rafter Callahan, B Blake Mills, Lois Milton Zimmerman, S Paul Hough. The group is seated outside on a grass lawn in front of an unknown building.